Modern Hand Reading Forum - Discover the language of your hands: palm reading & palmistry forum! :: V - DISCUSSIONS RELATED TO THE HISTORY OF PALMISTRY :: Va - ANCIENT PALMISTRY - What are the basics & origins and where did it come from? :: Vd - Does Palmistry have it's roots in Astrology? Has anyone experience with astro-palmist who could accurately see your date of birth? Many say that birth horoscope chart can be made palm . But i do not agree since it's not only placemat of planet in houses for correct prediction their digree also matter . Slight change in house or digree can change the prediction. I bought that book in 80s. I was not useful book to me. I use several techniques and the ones in book was no value addition for me. How much it costs now? I think, buy it and discover it. It may be of use to to you. In areas like occult, astrology and palmistry, everyone has different journey. Also, I think most (modern) hand readers reject the idea that the date of birth can be found in the hand (even by many of those who are involved in 'astro-palmistry'). I hope this info will become helpful for you anyhow. The book is on Palmistry. This is a feedback to remove comment "I think that his book should be recognized to represent basically a branch of astrology.". Otherwise this might be source of MIS-QUOTE by many in future. Sorry, in your suggestion I see no need for me to remove anything at all, because Chawdrhi's first book 'Prasna Deepika (Horary Astrology)' was presented in 1979 and was solely devoted to astrology. The man is an astrologist by nature, and this is confirmed by most other titles that he presented. PS. The author L.R. 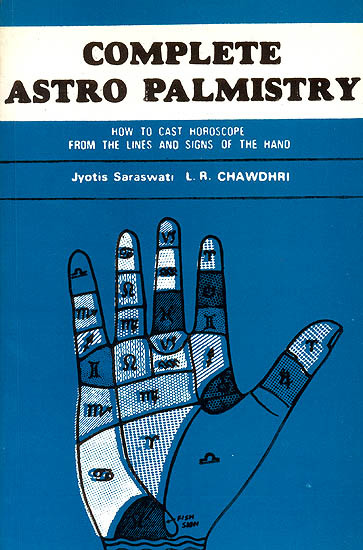 Chawdri also presented books about quite a few other topics (that go beyond astrology, and beyond palmistry); palmistry probably was not much more than just one of his interests... but palmistry is obviously not his main expertise. "This book unfolds the methods of casting a horoscope from the lines, signs and marks on the hands, when the date and time of birth of a person is not known and if known, in most of the cases it is erroneous. Also the methods of exhaustive and scientific analysis of lines, signs and marks on the hands, physiognomy and pedomancy from ASTRO PALMISTRY'S view point have been detailed there in. These methods are not available anywhere but now have been expounded through mathematical formulae and 44 detailed illustrations." HAVE YOU EVER READ THAT BOOK ONCE? Nope, but I think the summary clearly describes what's inside the book. PS. Do you always need to read a book completely to know what's inside? I had bought a book of L.R.Chaudhary on Palmistry. I did not find anything new in it that I had not read elsewhere. pravin kumar wrote: I had bought a book of L.R.Chaudhary on Palmistry. I did not find anything new in it that I had not read elsewhere.